good or bad time to go, when one place is wet another is sunny..." Hmm, not much help — as a traveler you're likely to be interested in visiting several parts of the country, not just one area or may want to visit a specific place, like Sapa, which at over 1,000 meters can be freezing during the winter months. Typhoons can also occur in other months. Overall, the best time to go is December through May or even June when rainfall is minimal and there are warmer but not extreme temperatures. Only a little drizzle — let's ride! 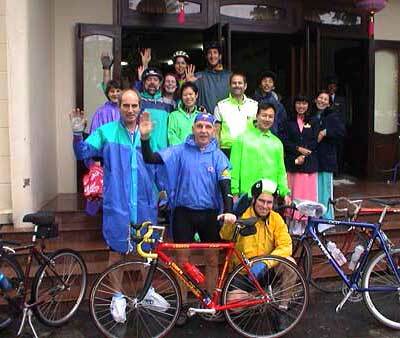 In general, don't be dissuaded by this possibility of this rain outside the monsoon season (or in the monsoon season), unless your set on having beach time — the light drizzle will not interfere much with sightseeing and places such as Hue and Hanoi often have overcast weather with light rain (see photo of our bikers going for it!). Absolutely need your Vietnam trip to be a sunny one? Then May through mid-July is a good window. If you're planning a September or October trip during monsoon season, rain typically arrives in the afternoon but the weather is warm and comfortable averaging nearly 80 degrees. Monsoon rains also typically only come every other day, leaving bright sun in between. A BIG caveat—seasonal typhoons and annual flooding occur in September and October,a nd occasinally Novemeber, on Vietnam's central coast! In 2011, for example, in early and mid-October there was severe flooding throught out the region, including the temples of Angkor and Bangkok. Like much of Southeast Asia, Vietnam weather is tropical weather with a monsoon season which means while there are relatively slight variations in temperature, depending on the season and the altitude, the primary seasonal changes in Vietnamese weather are marked by variations in rainfall. Vietnam is typically humid and warm, although the weather can vary significantly from one area to another due to the long length of the country which encompasses several weather zones. * Sept to early November: Typhoons possible! * November: Hue and Hoi An floods possible! * Sapa freezing and cloudy in Winter! Note for Sapa and travelers by region: Weather in Vietnam can be affected by variance in altitudes. For example, in late 1999 there was snow in Vietnam (in Sapa, located at over 4,000 feet) while it was nearly ninety degrees in sweltering Saigon. Flooding is common in the central coast region around Hue and Hoi An and Vietnam had back-to-back years of devastating flooding in this region during 2000 and 2001, and 2010 — travel companies may list tours for the rainy period, but plan your trip dates carefully or your trip may be a washout. Though the weather overall is good, the weather may also fluctuate during the tourist season (December through March), when cold spells and/or unexpected rain may pass through. In 2008, the north and central Vietnam experienced it's coldest weather in over 40 years, and the usual sunny skies on the central coast gave way to consistent rain and very chilly weather all the way to Nha Trang. Temperature remains almost constant in Saigon, rain or shine, while in Hanoi there is a marked cooler season from the chilled winds blowing down from China, from November through March and warmer period during the summer ("cooler" is relative, you will not likely need a jacket aside from Hanoi and Halong Bay). See our Vietnam Weather charts below, showing the levels of rain and temperature for north, south, and central Vietnam by month of the year. 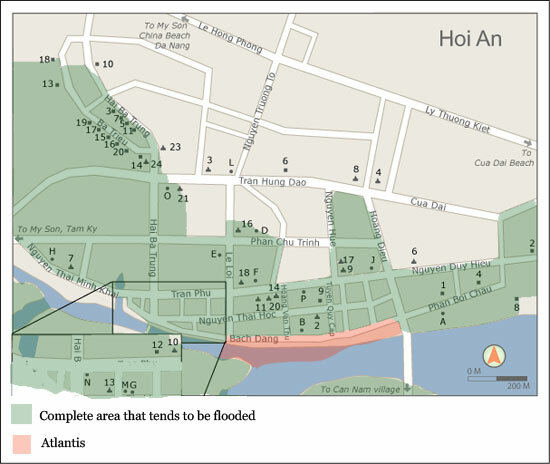 Since flooding is common and even a bi-annual typhoon a possibility, a most important decision for traveling in Vietnam is to avoiding the monsoon season in late July and August (See flooding map below from our friends at Travelfish on their blog article "Flooding in Hoi An in October and in November." Predicting typhoons is similar to roulette, with the odds a little better as hitting the number of your choice. In other words, don't be discouraged from visiting during during the typhoon season but understand they do hit Vietnam (roughly a few days, every other year). The typhoon season lasts longer from July through November, with the most severe storms occurring along the central coast. Typhoons in this region frequently lead to serious crop damage and loss of life (Image: Typhoon Xangsae). So when is the best time to visit Vietnam? Below are some charts to help you further gauge when to travel. Our scheduled tours are limited to the drier weather period of the year: December through April (although we do arrange custom tours year-round in areas that may be dry). During December, the weather north of Danang (and the Hai Van Pass) can be cool and rainy. January through March are optimal months to travel the length of Vietnam (combined with humidity, it is not as cool as the chart below reflects). However, Sapa does not thaw until around the first week of March. And when is the best time to visit Sapa? Specifically for Sapa, September through November, and March through May are the best weather periods for trekking and cycling in Sapa. Daytime temperatures range from 15-28 C°, and night-time temperatures from 18 down to 10 C°. Trekking and cycling are possible at other times too, but in the wintertime the weather at over 4,000 feet (1,600m) can be bitterly cold (in the 30s F°!) with fog and drizzle. The summer can be rather wet, not ideal for slippery paths. Please ask about our Mai Chau trips southwest of Hanoi if your trip is during these cooler months. December travel? The rainy weather has already tapered, but the temperatures can be cooler and drizzle persists in Hue. 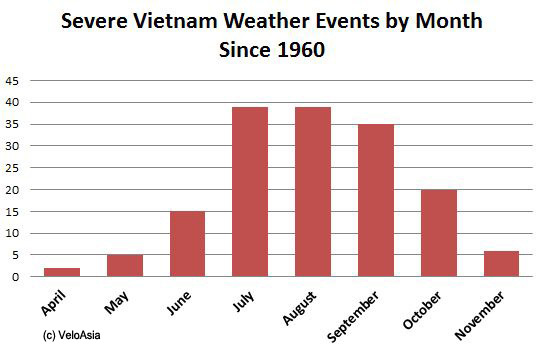 Here are some historic weather records for Hanoi (north), Hue and Hoi An (central), and Saigon (south) Vietnam during the month of December (in Fahrenheit). What is Sapa like in December? Little rain, but lows in the 30-40s°F. A decade-long summary of peak weather events that have disrupted travelers in and to Vietnam by areas affected. Also, check your Vietnam travel dates against our handy risk chart at the bottom. Global warming in Vietnam Update 2011: December through mid-March had unpredictable swings in temperatures and rain in the north and the central coast (with record cold spells). Note: During some months below, the Vietnam weather charts below may look like heavy rainfall, but in some places such as Hue or Hanoi, this does not inhibit on and off-bike sightseeing.